Dog owners have never had more choices for what to feed their dog, to the point where it’s downright intimidating to try pick out a dog food. With so many choices it’s hard to know where to even begin. What’s a normal price for dog food? What ingredients are normal and which are concerning? Is the nutrition of this dog food good? What dog food brands are reputable? We had many of the same questions, so the Woof Whiskers team set out to find some answers by doing some in-depth analysis of all the dog foods listed for sale on Chewy.com. We looked at over 1,300 dry dog foods from 111 different dog food brands to try to discover as much as we could about the current dry dog food market, and here’s what we found. 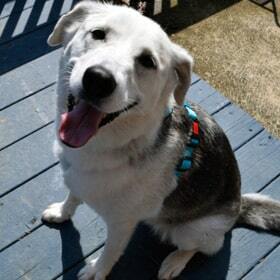 The price of dog food is something we all think about and take into consideration when choosing what to feed our dog. If you’re like most people, you don’t want to spend a fortune to feed your dog (especially if you have multiple dogs or large breeds), but you also don’t want to buy something so cheap that you question what could possibly be inside of it. Here’s a look at the cost of each of the bags of dog food we looked at. The average cost for a bag of dog food is $49.49. The cheapest bag in our list was just $5.48 and the most expensive was $120.99! Before you wrack your brain too much about those price differences, it’s in large part due to the size differences of the bags – the $5.48 dog food was for 4.5 lbs of Purina Moist and Meaty, whereas the $120.99 bag was for a 32 lb bag of prescription Royal Canin dog food. Prescription dog foods are often the most expensive as they’re typically made with stronger quality controls to ensure no cross-contamination with their limited ingredients. Another way to think about dog food prices is how much you’re paying per pound of dog food, or “price per lb”. This takes into account bag size. In the above examples we can divide the price by the lbs in the bag and find the 4.5-lb Purina dog food costs $1.24 per lb, while the 32-lb Royal Canin food costs $3.78 per lb. Still a big difference, but not as much as you’d expect going by price alone. The average price per lb of the dog foods we looked at was $2.19. Using this methodology we can also crown the cheapest and most expensive dog foods on the market! The cheapest dog food on the market was Kibbles ‘n Bits Original. At $22.99 for a 50-lb bag of dog food, the price per lb was just 46 cents! This dog food wasn’t too much of an outlier either, we found over 20 dog foods costing 75 cents or less per pound. 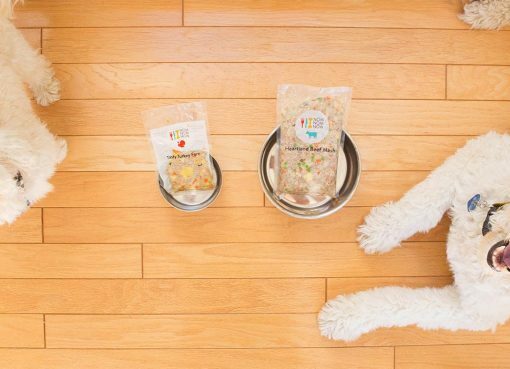 Three brands dominated this cheap dog food space – Kibbles ‘n Bits, Dog Chow, and Alpo. Each of these brands had more than one dog food formula in the top 10 cheapest dog foods. When it comes to the single most expensive dog food, that came out to be Addiction Nutri-RX Allergy-HS Ultra-Hypoallergenic Dry Dog Food. Coming in a small 2.2 lb bag, this dog food cost $28.15 when we collected our data, giving it a cost of $12.80 per lb. This dog food is so expensive that even if you took $10 off the price, it would still be the most expensive per pound. The most expensive dog food brand overall is Royal Canin. This can be explained for a few reasons, the first of which is they make small bag sizes that many other manufacturers don’t. Their Dachshund Puppy Dry Dog food is the most expensive, costing $18.89 for just 2.5 lbs of food which gives it a $7.56 price per pound! Royal Canin is also one of the few brands that offers prescription dog foods which tend to be more expensive as we mentioned early. Overall, Royal Canin made up 18 of the 20 most expensive dog foods in our list, mostly due to small bag sizes. This leads us to one more way to think about dog food and prices – what’s the relationship between the price per pound and the size of the bag? Looking at the above chart we can see that you generally get bang for your buck when you buy bigger bags of dog food. Association of American Feed Control Officials (AAFCO) to calculate the dry matter protein, fat, and carbohydrates in a dog food. The formula itself isn’t very important to know the details of, it just allows us to compare apples-to-apples when looking at different dog foods because many are packaged at different moisture levels. Now that we got those details out of the way, here’s a look at the nutrition in our 1,300 dog foods. As you can see, fats fall into a closer range of values where carbs are the most varied. The average nutrient breakdown of dog food is 28.9% protein, 15.5% fat, and 50% carbs. If you’re wondering why these values don’t quite add up to 100%, it’s because the average dog food has ~5% fiber which isn’t included in any of the above nutrients. The AAFCO recommends a minimum of 18% protein in adult dogs and 22.5% in puppies or lactating dogs. In the dog foods we looked at we only found 6 dog foods with less than 18% protein contents, all of which were prescription blends for dogs with kidney issues. A low-protein diet lets kidneys not work as hard, so this makes sense. 50 dog foods came in under 22.5% protein, many of which were also prescription blends or those with “limited ingredient” formulas for dogs with health issues. One thing we’ve always wondered is do more expensive foods tend to have higher protein content? This seems intuitive since you would expect meat to be the most expensive part of dog food, and cheap dog food to use fillers like corn. Since we were most interested in seeing if a cost-protein relationship exists for an average dog food, we decided to remove 66 expensive, low-protein dog foods from the charted data for the reasons stated earlier. These dog foods are expensive due to their more controlled production environment and are lower in protein on purpose due to restricted ingredients or for easier kidney function. Prescription foods simply don’t fit in with the truth we’re seeking here which is basically “do cheaper foods skimp on protein”? Looking at the graph above you can see that there appears to be a relationship between protein content and price per pound of dog food, but it’s not as strong as we would have expected. One explanation for this lack of relationship between price per pound and protein contents could simply be there’s no real relationship between the two and my expectations are just incorrect! Many of the most expensive dog foods are still not very high in protein comparatively, so if you’re looking for a high-protein dog food don’t assume the expensive bags are what you’re after. Dog foods are required by law to list their ingredients on their packaging and ordered what makes up most of the food by total weight of the ingredient. This means we can look at the first item listed on the ingredient list to know what primarily makes up each dog food. So what are the most common first ingredients used in dog food? 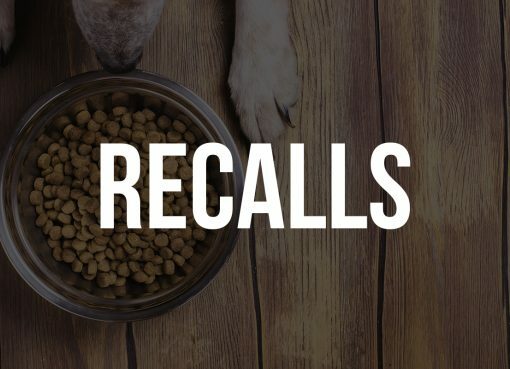 We narrowed the list down to first ingredients with at least 5 or more different dog food formulas to make sure the chart didn’t get too crowded. 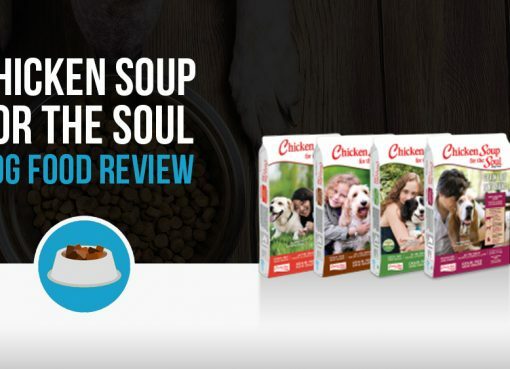 Unsurprisingly chicken is the most common first ingredient in dog foods. It’s a good source of protein and the cheapest kind of meat to use, so not much else comes close! What’s most surprising to you? We wouldn’t have guessed that Lamb would have been so popular. Now let’s take a look at the protein content of the dog foods grouped by their first ingredient. Unsurprisingly, those with a grain or vegetable as their first ingredient are the lowest by a good margin. How about the cost of each dog food, grouped by first ingredient? Corn being the cheapest overall is not surprising again, as well as chicken being relatively cheap compared to most other sources. One thing that may surprise you is Potato and Brewers Rice being so expensive. This is because these are typically the first ingredient in those expensive prescription dog foods we’ve mentioned several times. Now let’s take a look at some other interesting findings we found diving into the ingredient lists of these dog foods. Most popular vegetables and how many dog foods they were found in – peas (484), carrots (358), sweet potatoes (218), spinach (208), and potatoes (202). Most popular fruit in dog foods- blueberries (363), cranberries (260), and apples (238). Now let’s take a look at dog food brands to see what kind of generalizations we can draw from the data. Other interesting findings – Papayas were found in 67 dog foods, peppermint was in 34, dandelion in 21, crab in 10, and kangaroo in 4. Blue Buffalo led by a great margin, followed by Taste of the Wild and American Journey. Finally, let’s see which brands are the cheapest and which are the most expensive. 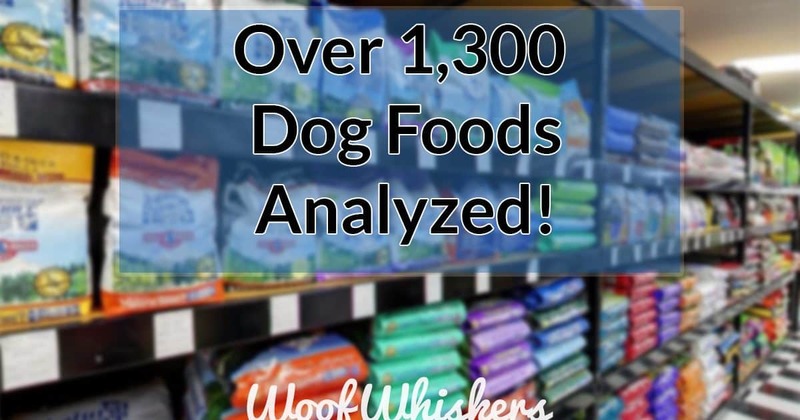 We had to limit the brands charted to those with at least 10 different dog foods on the market, and even that left me with a large number of brands to plot! Here we see some pretty massive differences between brands. On the cheap end of things you have classic brands like Iams and Purina. Within the different product lines of Purina you can see they offer different price points for different kinds of consumers. They have Purina Beneful for those looking for the cheapest dog food and Purina Pro Plan which is just below the average price per lb across all dog foods. How do you feel about the data above or the dog food industry in general? Leave a comment below and feel free to share this article with anyone interested in dog food nutrition. Are those all the dog foods with at least 5 types of foods or are some left off the chart due to space? Seems like some were left off. I went back and took a look and realized I had originally planned to do brands with 5 or more dog food formulas, but it looks like that was simply too many to display so I had to increase the cutoff to 10. I fixed that criteria in the article so it’s now accurate. Sorry about that! The fact that the average carbohydrate content of (the tested) dog foods was 50% goes a long way to explain the myriad of health issues facing the typical dog today. This is disgraceful. If you’re concerned about carbs, take a look at Ziwi Peak Air-Dried – It’s 96% meat, organs, with New Zealand Green Mussel. Extremely low in carbs, very nutrient-dense and digestible, so feeding amounts are small – often less expensive to feed than some of the kibble brands listed here. What information can you share on the dog foods developed by Dr. Marty Goldstein or Dr. Gary Richter? Both sound great, but what are dog owners saying?